We’ll just accept that somewhere along the way I became terrible at maintaining a blog, ok? That way I can spare you the excuses and spare myself the guilt of feeling like a slacker. Now, that we’ve gotten that cleared up, I’ll make it up to you with talk about Texas. Avocados, will they ever stop proving their awesomeness? Yes, Texas. Or really to be exact, Austin (since everyone’s been quick to point out that they’re two very different things). I went there last week and it was awesome. Really great food and drinks, sunshine for days, warm, friendly people and just all around goodness in every direction. 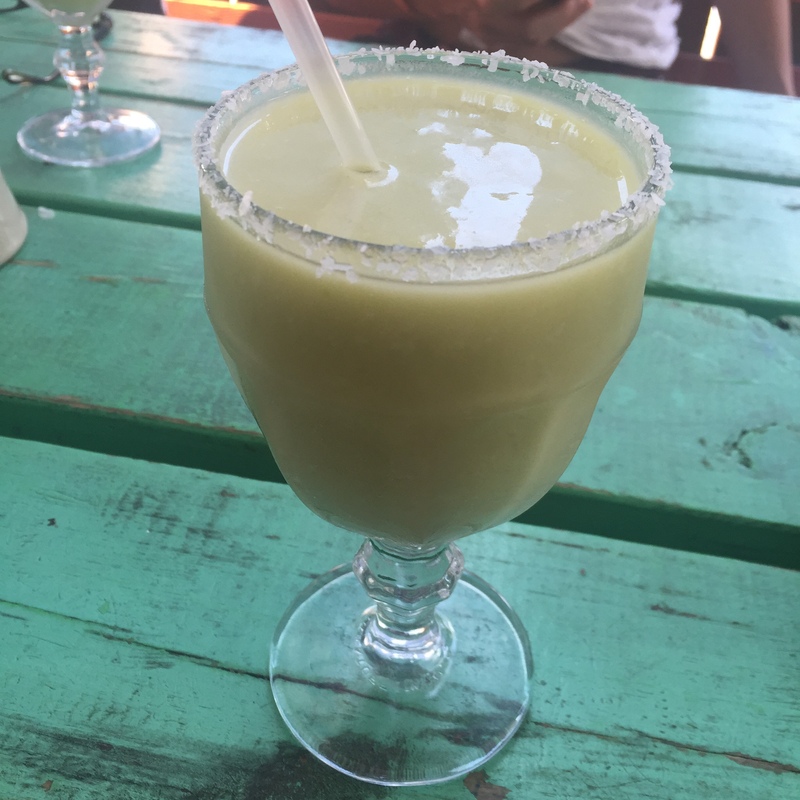 I didn’t eat or drink a single thing I didn’t love but my favorite was definitely the avocado margarita at Curra’s Grill. That’s right, let that soak in: avo-freakin’-cado margarita. Best tasting nachos ever… and total lookers too! And because I’m also a firm believer that you can never have too much of a good thing, I also had some of the best nachos of my life when I ordered the house special with pulled pork in mole sauce. Not only were they gorgeous (Just look at those colors, that composition! Perfection!) they were absolutely delicious. 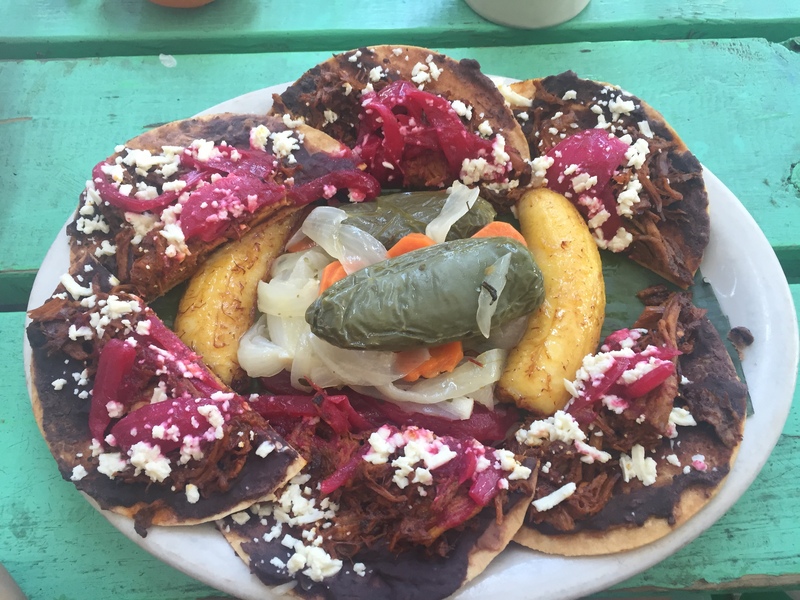 Each big, crunchy corn tortilla chip was loaded up with sweet pulled pork in a smoky, rich mole sauce, creamy black refried beans, tangy, juicy pickled beets and a sprinkle of crumbly queso fresco, all around some of the sweetest, softest fried plantains and insanely hot, roasted green peppers. I mean, it doesn’t get better than all of that. Add a couple of friends to the mix, a bit of shade from the sun, and you’re looking at a pretty perfect afternoon. Austin, consider me a fan. 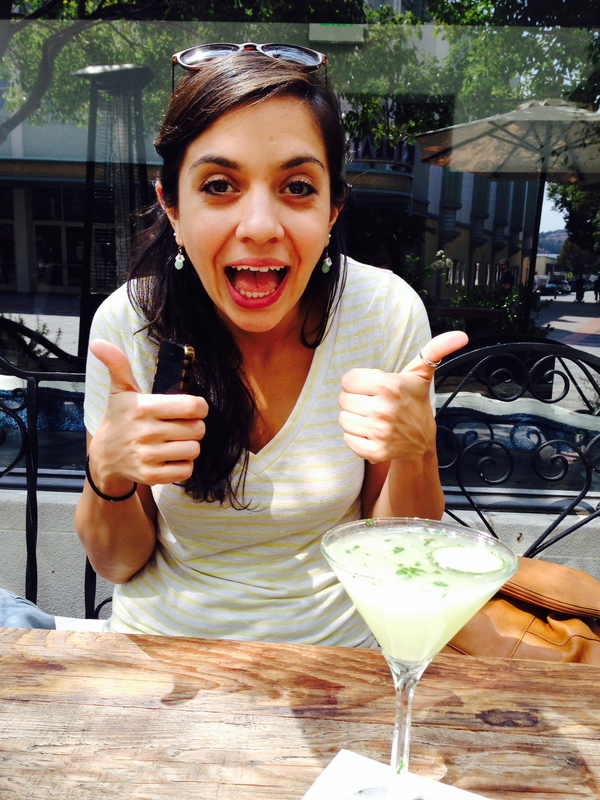 California sun and a nice drink make for a happy camper. So happy, in fact, that I’m doing that face where I look like a cartoon. I’m usually in a bit of a funk after I come back from a good trip somewhere. You know, the ol’ post vacation blues. But since coming back from California last week, where I spent a damn near perfect eight days, I’ve managed to not only not be mopey, but rather hold on to my vacation high! Gorgeous weather in both Los Angeles and San Francisco (read: sunshine, cool breezes and not a single tiny bit of humidity), amazing friends who showed me the best time, and for the purposes of this blog: SO. MUCH. DELICIOUS. FOOD. Seriously, SO much. Come think of it, if i’m still buzzing off my vacation, it could be that I’m actually still digesting all of the great things I ate. I know, it’s kind of a gross thought, but it’s true. I ate a lot of stuff. Tasty stuff that I’m gonna tell you about a little at a time so as to not overwhelm anyone (myself included) with all of my California grubbing memories. 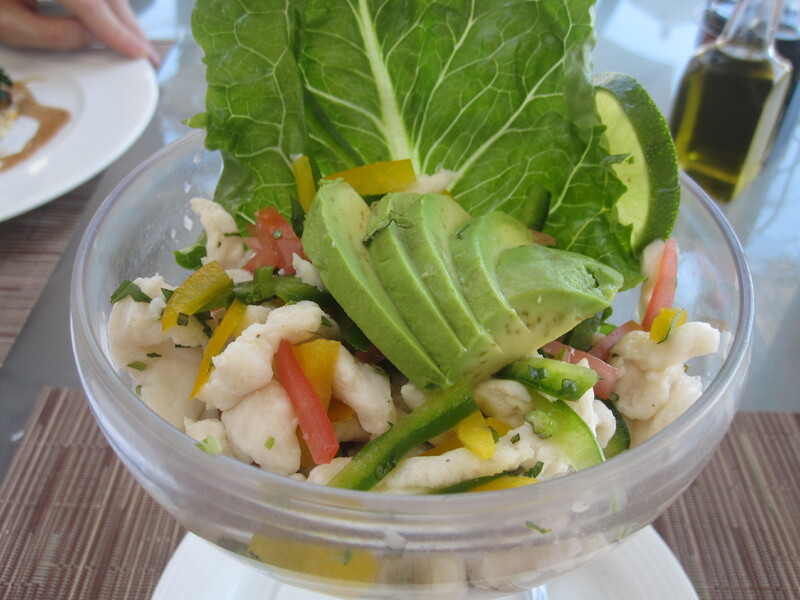 To start off, let’s talk ceviche, which I looove. Fresh, colorful, zesty, delicious ceviche, which is just the kind I had with my darling friend, Arlene at La Cevicheria in LA. 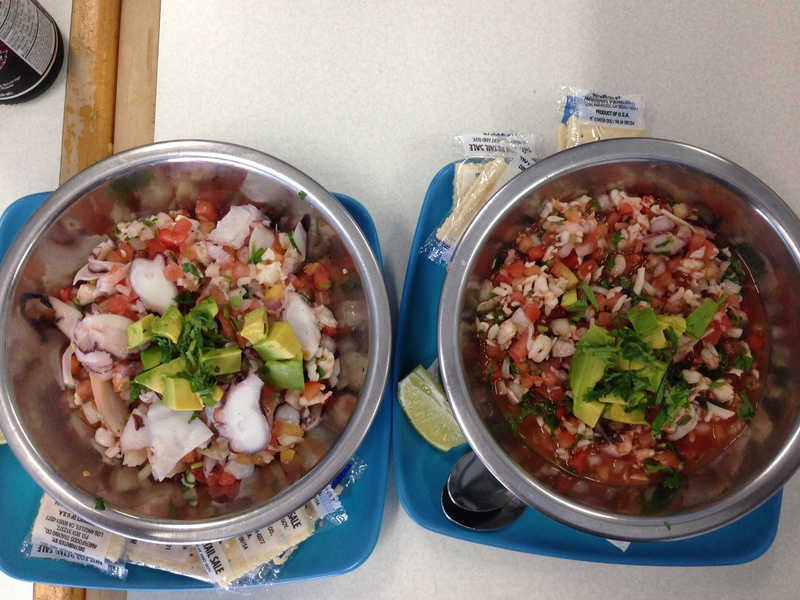 It was a no-frills kind of place, but the ceviche we had, both humongous bowls of it, was great. They were both different, but to be honest, in my hunger induced frenzy to wolf it all down as soon as it came out, I forgot to jot down what they were. What I can tell you though, is that octopus, shrimp and crab were involved, as were limes, avocado, onions, Worcestershire sauce and something I don’t remember ever having in ceviche before but loved, mint. Add a little dash of hot sauce and scoop a big heap on to a crispy tostada and you’re looking at a fantastic meal. Not surprising that a place that makes great ceviche would make fantastic fish tacos. 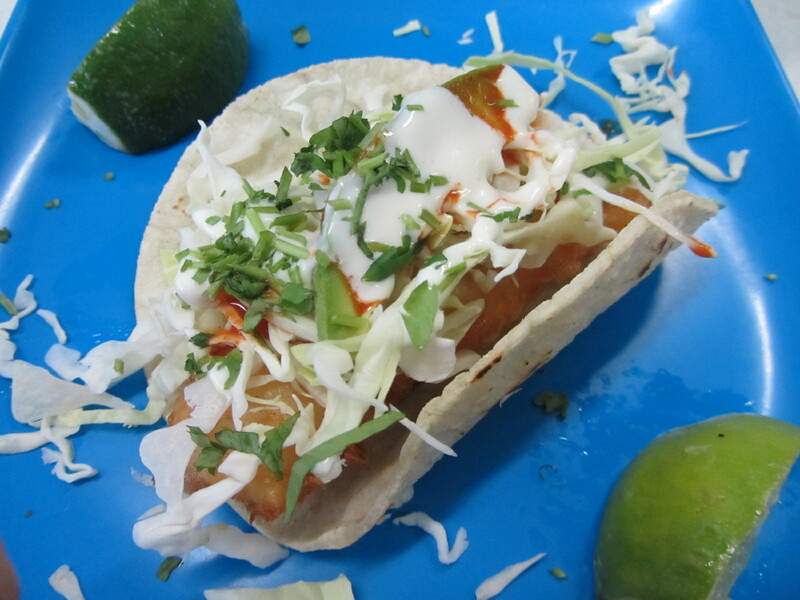 But because I tend to struggle with moderation at times like these, we also got an order of fish tacos. Each soft tortilla was stuffed with a fat, juicy hunk of crispy fried fish, shredded cabbage, avocado, tomato and cilantro. Simple and perfect, one of the best fish tacos I’ve had. It was my first time in LA, and even though I was prepared to not like it (because I imagined it would be the Miami of the west coast, and that’s an off-putting thought for me), I ended up loving the City of Angels. It was the weather, the beautiful people (i.e. my friends) and yes, the delicious seafood I scarfed down that afternoon. *Note: Yes, the title of this post is a Tupac reference, cause you know what, I’m a big ol’ Tupac fan. Boom. Chew on that. Avocados for dessert? Yes, please. When a friend told me recently, albeit half jokingly, that she wanted to open a restaurant where everything would feature avocados, I was one hundred percent behind her. It might not happen anytime soon, unfortunately, but dear sweet baby Jesus I hope it happens sometime in my lifetime, cause I LOVE AVOCADOS. I love thick wedges as a side with rice and beans, and creamy slices stuffed in my sandwiches. 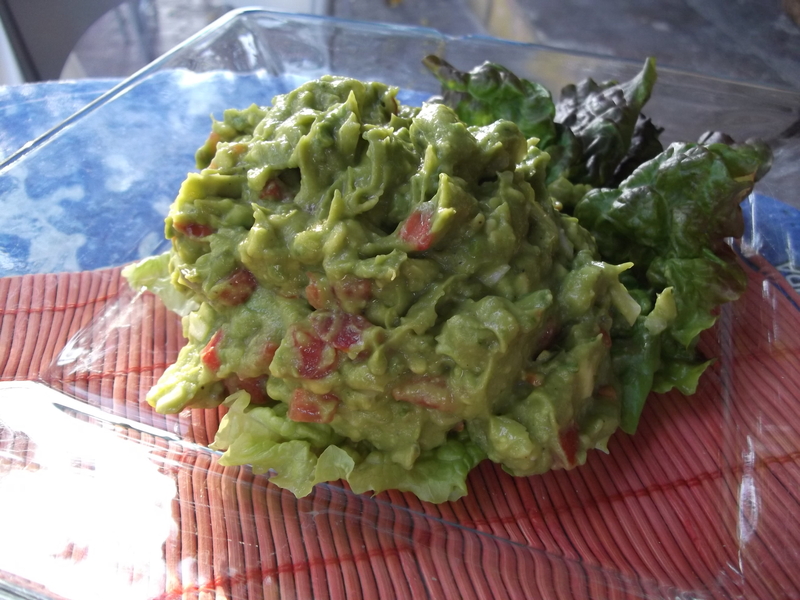 Fresh-made guacamole makes me go batty, and even when it’s just plain and being scooped out of its shell with a spoon (something that always gets a “What are you eating? ?” from someone around me), I LOVE avocados. So you can imagine what happened when I read about a new Cuban luncheonette/ 24-hour diner named Coppelia that recently opened and had avocado ice cream on their dessert menu. My mouth started to water and I could just feel the crazy look in my eye. The antsy dance (you know, like when you really need to pee) may have been involved. My love for avocados just reached a whole new level: dessert. Yea sure, there were other things to eat at Coppelia including ropa vieja, Cuban sandwiches, fried yucca and all sorts of other staples, but I’ll be honest, being from Miami (i.e. Northern Cuba) I’m kind of picky about my Cuban food. I like it cheap, abundant, and usually served by a little old woman with an attitude. It’s just part of the experience. So yes, I had dinner there, and yes, it wasn’t bad, but it wasn’t anything to write home about… especially when home is Miami. But the dessert, the whole reason I went to Coppelia, was great. I’m not sure how Cuban avocado ice cream is, but I don’t really care either. I LOVE them, remember? And here was a whole dessert centered around it! 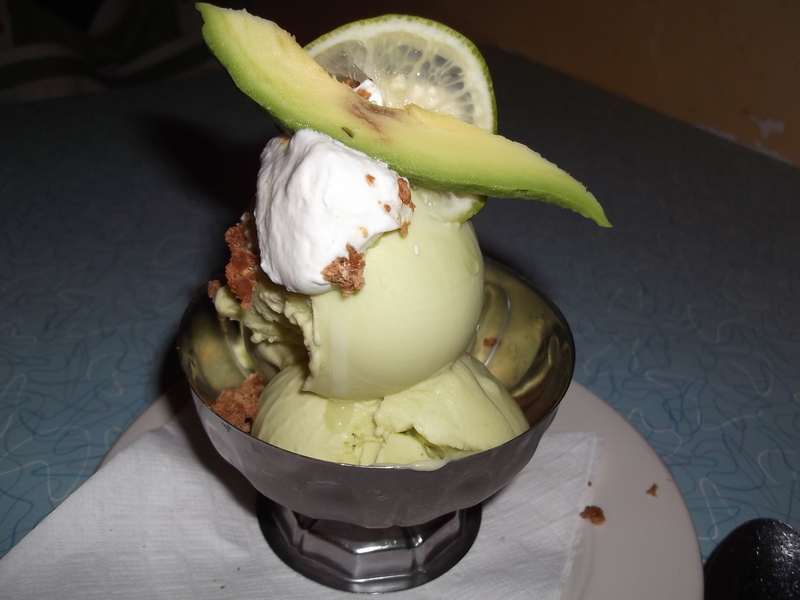 The actual ice cream, a pale yellow-green color similar to the very inside of an avocado, the part closest to the pit, was buttery and smooth, almost the same consistency of a perfectly ripened avocado. The flavor, which I think is what would worry most people (though definitely not me) was much more subtle and delicate, so that really it was more of an avocado aftertaste that was left lingering on the tongue. To play up the avocado’s sweet notes, a couple dollops of fluffy whipped cream made it seem more dessert-like while crumbled panela, a hard, molasses-like, unrefined cane sugar, added a nice little crunch amongst all the soft sweetness. And finally, just to bring out a tiny bit of the avocado’s other, less desserty flavors, coarse Maldon salt and a few drops of lime juice. 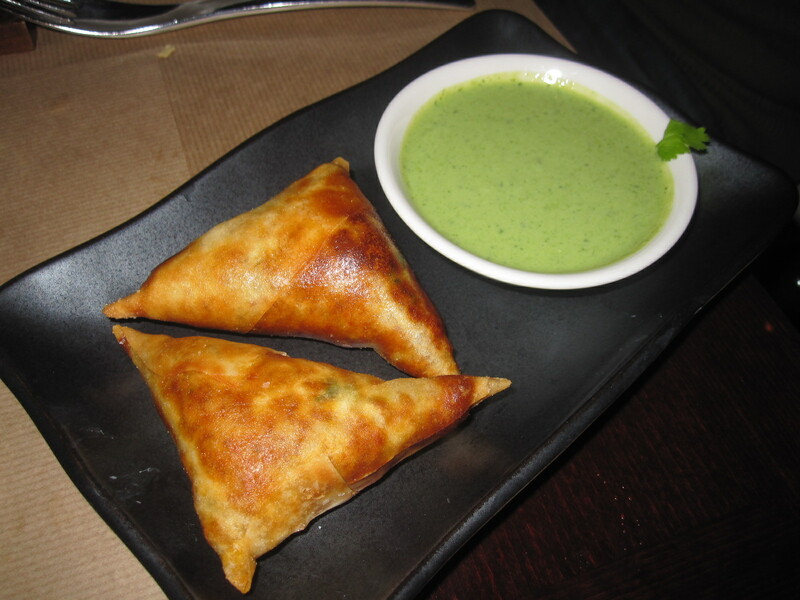 Sweet, avocado deliciousness. If my friend ever opens her avocado eatery I’ll root hard for an ice cream dessert like Coppelia’s. And hopefully, as one of her most ardent supporters in her avocado endeavors, that’ll mean there will always be a table with my name on it. I’m one of those people that actually likes change. If it doesn’t happen by itself, I get antsy and go looking for it. That even applies to what I eat, most recently brunch. I’m all for the usual suspects, French toast, sausage and scrambled eggs, but I needed something new and slightly different during brunch, so I went looking for it not far from my apartment at Cafe Gitane at The Jane Hotel. Instead of the standard omelet or plate of scrambled eggs, the Moroccan inspired Cafe Gitane offered me baked eggs with smoked salmon and roasted potato chunks. The three eggs baked in the ceramic dish were cooked to a soft, gooey consistency so that when I punctured their almost perfectly flat surface with a toasted piece of baguette, a runny stream of orange yolk erupted out on to the otherwise white eggs. The salmon lent it a big, smokey flavor and the potatoes made it chunky and hearty. The whole thing was reminiscent of eggs and potatoes yet different enough that it was a new and delicious plate all together. 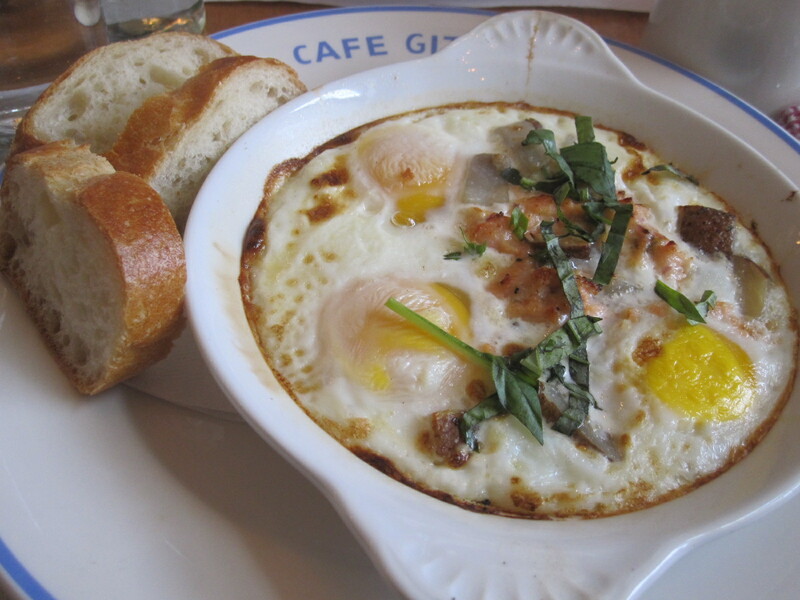 And while the baked eggs were good, even better was Cafe Gitane’s delicious spin on breakfast toast. A thick, dark slice of seven grain toast was slathered with a creamy, buttery spread of avocado, lemon juice, olive oil and red pepper flakes. The bread was nutty and rich while the avocado was bright, tangy and zesty. 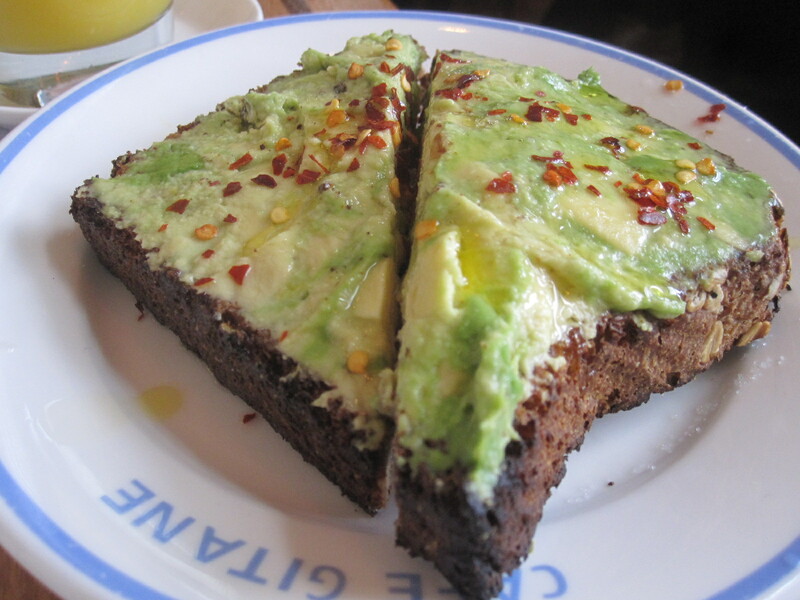 Really, this avocado toast would have been good with any meal, any time of day. There weren’t pancakes, biscuits or bacon that I could remember, but it was a nice another example of how a little change could do you good (or at least taste pretty damn good). The end of NYC Restaurant Week is bittersweet for me. On the one hand, I’ve had lots of really great food over the past two weeks and tried lots of new dishes and new restaurants. On the other hand, all this eating out is making me feel like an absolute cow. I’ve been avoiding the scale at the gym like it’s an old boyfriend. I walk into the locker room and immediately look down, as if I make eye contact, I’ll be forced to go over and say hello. And then everything will get awkward and uncomfortable. But of the different lunches and dinners I’ve had over the last couple of weeks, my favorite was at Spice Market, the massive Jean-Georges Vongerichten restaurant in the Meatpacking District. With two choices for each of the four courses offered, Flaneur and I successfully managed to get everything that was on the southeast asian inspired restaurant’s RW menu.